Shannon at work in Caye Caulker, Belize; just one of her many temporary offices. If you work in any information field, you likely already possess skills and contacts that can be leveraged into a mobile profession. Just about any professional endeavor, whether reviewing legal documents, building spreadsheets, entering data, drafting engineering plans, or writing code can be done remotely. The upside of “outsourcing” is that technology now enables us to compete for work anywhere in the world. Employers are increasingly looking for solutions wherever they can find them. Find a way to add value and you’ll have no shortage of work opportunities. To tap this global employment market, you need to think broadly about how your skills can fit various business needs. Look for freelancing opportunities at your current place of employment and check with competitors for consulting gigs. Imagine how what you do currently can be expanded or tailored for other purposes. Put together a business plan emphasizing how you can do more and better for less. Then hit the pavement selling yourself to whomever you can wherever opportunities exist. Writing is not the easiest way to make a buck, but it is a proven one. It’s also a field that is surprisingly broad and deep. Consider that nearly every written word you see, and many spoken ones you hear, are paid for. That pool of opportunity extends far beyond novels and glossy magazines. Industry newsletters, technical manuals, speeches, scripts, advertising copy, brochures, hobby publications all need someone to write them. Best of all, these writing opportunities can supplement and support consulting ones. What better way to advertise your expertise in a field, and build your brand, than to write articles in relevant industry publications? For most people building a book of business from scratch takes a considerable amount of time and a fair amount of trial and error. It’s uncommon to be able to support yourself completely from a brand new business the very first year. In our case, we experimented with freelancing for several years before diving into it fulltime. During that time we figured out what worked, what didn’t and what was possible. We built relationships, expanded contacts and gained trust – all with a steady paycheck to fall back on. The opportunities to support yourself on the road are limited only by your imagination and your willingness to adapt and overcome. If you look around you’ll find as many ways of earning a living as there are people doing it. Gary Arndt from Everything-Everywhere combined his passion for travel and photography and just started offering photography lesson tours. Howard and Linda of RV-Dreams hold rallies to teach wanna-be RVers how to fulltime. Matt Kepnes of NomadicMatt sells several self-published travel books. On the road we met a guy who gives paragliding flights in Napal, Europe, and Central America; a couple of women who sell advertising in tourism maps; accountants with mobile offices; people selling crafts and others offering services. If you can think of it, somebody is probably doing it. Working for yourself, particularly on a freelance basis, is very different than working for a typical employer. You don’t get paid for just showing up and doing what you’re told. Instead, you get paid for figuring out what someone needs, convincing them that they need it from you, and then giving it to them in a way that exceeds their expectations. If you do that successfully, you’ll earn exactly one paycheck. If you want another paycheck, you have to start the process all over again. We’ve also learned that not all rejection is final. We’ve had clients come back to us months or sometimes years later to reengage on an old pitch. We’ve also had editors decline a specific idea but offer us something different instead. Would we have gotten that work had we not sent a “failed” pitch? No. We didn’t get the work we pitched, but the check cashed just the same. In the five or more years of freelancing fulltime, our “bread and butter” sources of income have changed each and every year. Previous employers go bankrupt. Lucrative contacts leave. Work is “insourced.” Projects simply go away. We have only the vaguest idea of who will pay us for work this year. But we have confidence that whatever happens we’ll be able to adapt to the obstacles and opportunities as they present themselves. As a hired gun, you’re only as good as your last project. Turn in work that is mediocre, or, God forbid late, and not only will you ruin that relationship but possibly your reputation as well. Businesses want contractors who are going to make their lives easier. Be the person that proactively solves problems and makes the chap who hired you look smart and you’ll be called back for encore performances. Most of us won’t get rich or famous working location independent jobs. We’re not likely to be best-selling novelists or start-up millionaires, but that isn’t the goal. At least it isn’t our goal. Our objective is to work to live, pure and simple. We don’t need anything more than that. What we do need is for our commitments to bend to the lives we want, rather than the other way around. We’re willing to sacrifice stability and affluence to make that happen. So far, we’re delighted with the results. Excellent advice, and a good reminder that nothing comes easy or without work. Thanks for such a great post! Very nice read. Hope to use them as opportunities strike! I quite like Shannon’s temporary office! Thank you for passing on your experience. Your advice is sound and appreciated. Great post! Thanks for sharing your knowledge and insight. Really great blog! 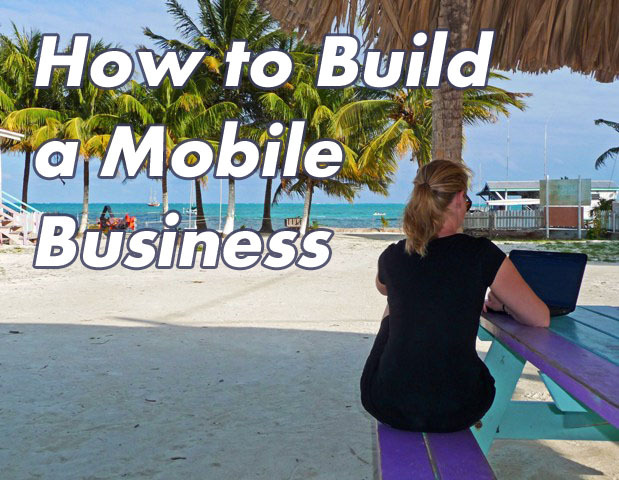 I am working on my own “mobile” business and have a practical question. What type of accounts do you use to be paid? I am mostly trying to build my business internationally and wondered if you have any experience with how to do this. Great advice! I love the encouragement you provide here, especially when you say, “Be Realistic.” I’m a self-published author, and I work part time as an accountant. Though, accounting pays the bills at the moment, it’s also the thing I do in order to pursue other passions in life that could possibly take over in the financial department. I love your simple goal of “work to live.” My husband and I agree wholeheartedly!! It sounds like you have a good balanced approach, which is pretty much our style too.